The scenery along the Frenchman River Valley Ecotour in the West Block of Grasslands National Park in Saskatchewan, Alberta is beautiful except for the mosquito swarm outside the truck window. During the summer months, the climate along the Frenchman River Valley Ecotour in the West Block of Grasslands National Park in Saskatchewan, Canada can get extremely hot, a prime factor to lure in a mosquito swarm. Outside a truck window driving the Frenchman River Valley Ecotour, one can see how many mosquitoes there are, keeping most people locked inside their vehicles. A few seconds outside of this truck could lead to many bites and people have become more leery of mosquitoes since the West Nile virus. Throughout Saskatchewan, Canada, there has been a count of about 17 species of these insects but only a few have the remote chance of carrying the virus. The drive along the ecotour is approximately a 28 kilometer round trip which takes about 1 1/2 hours to complete. A mosquito is not the only type of wildlife one will see as there are antelope, mule deer, black-tailed prairie dogs and hawks seen on a regular basis. 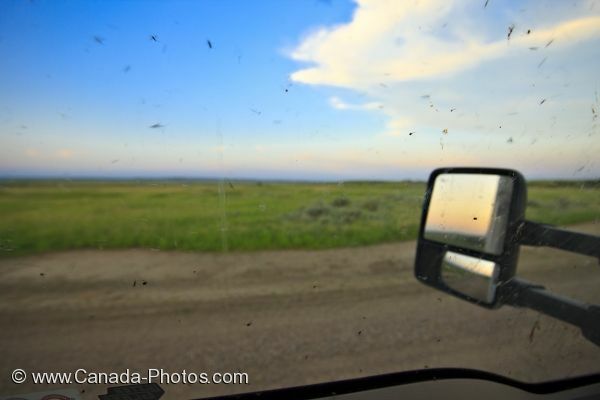 Picture of a mosquito swarm outside a truck window along the Frenchman River Valley Ecotour in Saskatchewan, Alberta. Mosquitoes outside the truck window while driving the Frenchman River Valley Ecotour in the West Block of Grasslands National Park, Saskatchewan, Canada.